A blend of essential fatty acids, Vitamin A, B6, E, Biotin and Zinc, all essential nutrients in helping maintain a healthy skin and coat. Nutritional food supplement for dogs that need special attention to help control shedding, scratching, dull coat, and dry flaky skin. Most beneficial for animal 8 weeks to 5 years of age. Use to restore skin and coat condition after treatment for non-nutritional problems such as parasites, trauma and allergies. Use to give that extra luster and beauty to dogs being conditioned for show or sale. Excellent supplement for short hair breeds. 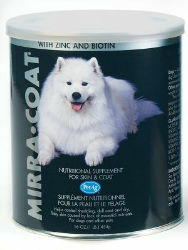 Dogs: Add one tablespoon (l tbs = 7.5g) of Mirra-Coat daily to an adult dog’s food for each 20 pounds (9kg) of body weight. Use ½ the recommended level for wirehaired breeds. Soy flour with soybean oil added, sugar, sunflower oil, soybean oil, silicon dioxide, dextrose, natural and artificial flavors, zinc methionine, vitamin E supplement, vitamin A supplement, pyridoxine hydrochloride, biotin, preserved with mixed tocopherols.